Beyond the Ning Nang Nong. Sharing your poetry books with children. I’ve mentioned before that, since they were 11 and 12 (they’re now 13 and 14), I’ve taken my own children to various readings and book launches – one or both of them have heard Cristina Navazo-Eguía Newton and Hilda Sheehan read, as well as Carrie Etter, Matt Merritt and Alasdair Paterson and they came with me when I read at the Derwent Poetry Festival last year. My daughter and one of my great-nieces, Lola, aged ten, came to the Live Canon Poetry Competition Prizegiving – the adult, not the children’s competition – and listened to all of the winning poems performed on stage. However, there’s always been at least one person (always an adult!) at all of these events who’s commented that the kids must be there under duress and that, given a choice, they wouldn’t have wanted to come. But this really isn’t the case – although I’m not saying I have to drag them away from their poetry books because they’re not spending enough time on Snapchat….. Even so, they’ve never moaned about poetry and they don’t switch off when poetry is going on around them. I know I’m not alone in sharing poetry with young people. I loved seeing this tweet from my new friend, Justine Wall. I met Justine through her work as a volunteer for The Reader Organisation in Wiltshire and she also wrote this beautiful article about the pleasures and benefits of reading aloud. Including poetry in your children’s reading menu might well encourage them to grow into people who don’t exclusively stick to prose and I love hearing about teachers who pin poems up around their classrooms and who read poems as well as stories aloud to the children they teach. (I’ve written about some of the poetry workshops I’ve facilitated in schools here, here and here). Even at the grand old ages of 13 and 14 my kids (and me!) 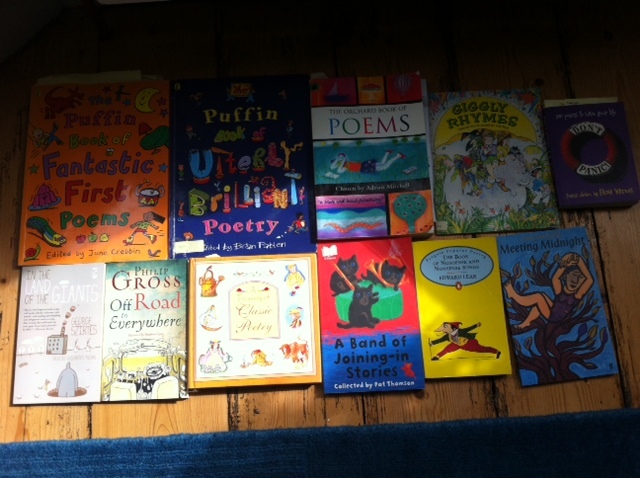 still thumb through dog-eared copies of poetry books for children we’ve collected over the years. But when they were about ten, while still enjoying “poetry for children”, my children wanted to dip into other poetry, including the books lying on their parent’s bedside table. Aged ten, my son had a homework assignment to find a poem to bring in and share with his class but he wanted something more “grown-up” than On the Ning Nang Nong (although we all still love that poem). After scouring through my poetry books, John found A Lullaby for Bullets by Brian Turner. The unusual title appealed to him and the poem provided us with a chance to talk about wars and killing. John was interested in thinking about soldiers as people who might not want to end another person’s life and about the reality of a life cut short. Like many boys of his age, he’s attracted to quite violent video games but this poem allowed us to think and talk about violence in a different context and he liked the poem enough to stick it up on our fridge. Since then, I’ve found myself more and more frequently sharing my poetry shelves with my children. Their responses often enlighten me and it’s especially lovely when they read a poem aloud to me, having found one they think I’d like. Do leave a comment if you have suggestions for poems you’ve shared with young people once they’ve started to look beyond the kid’s section at the bookshop or library. Have you seen Kenneth Koch’s books “Wishes, Lies & Dreams” and “Rose, Where Did You Get that Red?” “Wishes” is more about introducing younger writers to basic entrances into writing poetry, using “adult” poems, stuff as far afield as Blake and Ashbery. “Rose” is about introducing young readers to poetry using great poems, not just nursery rhymes or verse targeted to children. It’s great and fun stuff. At a certain age children have a grasp of some language and are still relatively fearless with it–that’s a great time to introduce poetry to them. Kids can get scared off of poetry much the same way they can get scared off of math or science–by people telling them it’s too hard or complex, or that there’s only one way to do it. Introducing my own children to poetry early on has been a lot of fun–they certainly have their opinions! and i do not try to “correct” them. It’s good they like what they like now. Let’s give them more stuff to like! Jeff, I don’t know these books but I want them for myself, they sound fantastic. I love what you say about scaring kids off – adults too – and it always helps to get recommendations such as yours. Really appreciate your comment!